Gift certificates are convenient, practical and perfect for shoppers who like to live risky and shop last minute. Read on and learn how to set them up in your store! Perform a search for the term "gift". 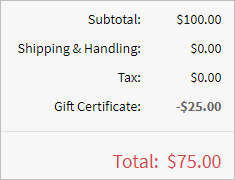 Make sure Enable Gift Certificates is selected. If it isn't, select it and save. Perform a search for the term "price". Make sure Enable Price Edit is selected. If it isn't, select it and save! In the Weight field, enter "0". Under Advanced Info > Misc, select Allow Price Edit. Enter any other product details you want to include, such as an image and description. Add the product to the appropriate Category(s). You may want to create a category specifically for Gift Certificates and add it to your main navigation menu or footer, so customers can easily find it. 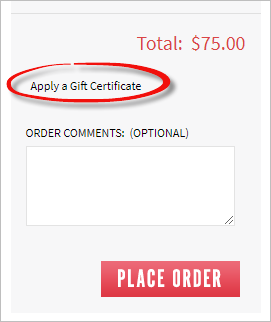 The gift certificate will now appear on your storefront like any other product! A customer places the gift certificate in their shopping cart as they would any other product. The customer is asked whether they want an electronic gift certificate delivered via email or a printed one delivered by mail. When finished, the customer can continue shopping or proceed to checkout. Once a gift certificate is ordered, it will be listed within the Gift Certificates table in your Admin Area. When the order is received, you’ll process the certificate automatically from the corresponding order's details page by completing the order. Electronic gift certificates will be issued automatically via email once you click Complete Order. Printed gift certificates need to be manually printed from a link on the Admin Area order details page. If a customer needs the Gift Certificate email to be resent to the recipient, you can go to Orders > Process Orders and open the gift certificate order. Under the Print links on the order, select Gift Certificates from the Email drop-down and click Resend. The recipient will be delivered another "You've received a Gift Certificate" email. From the Category menu, select GiftCert. In article IDs 190, 192, and 194, add "<!--" to the beginning of the value and "-->" to the end. This is how you comment out content in HTML (instruct the HTML document not to display anything between the tags). The page text articles mentioned above should appear in the manner below. Once a gift certificate is created, you can view or modify it on the Gift Certificates page in Marketing > Gift Certificates. Here you can modify, assign or activate a gift certificate. You can also see the current balance of active certificates. Gift certificates are one of the easiest ways for customers to shop your store. By following these easy steps, you'll have shoppers giving in no time!